Get away with every sip with these etched globe spirits glasses. Admire and enjoy these glasses from north, south, east and west. 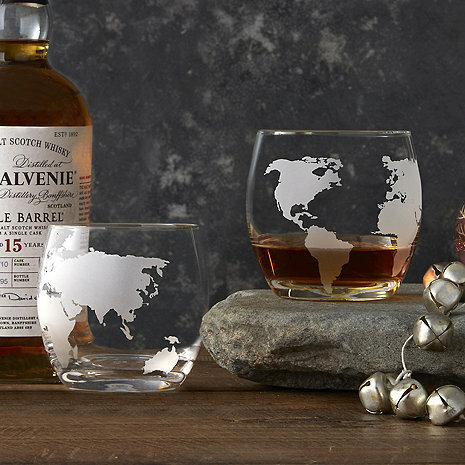 Decorative etching of the world map brings a new spin on serving spirits. Get away with every sip with these etched globe spirits glasses. Admire and enjoy these glasses from north, south, east and west. Decorative etching of the world map brings a new spin on serving spirits. These lead free glasses are recommended to be hand washed. How heavy is the box of a set? I purchased the matching decanter last year for my husband and he was impressed. It is filled with Irish Mist and so it was a nobrainer to purchase these matching glasses. They are comfortably weighted, easy to handle, and beautifully etched. Batting 100% on gifts for my husband. I bought two sets of 2 wiskey glasses and one glass had an air bubble in it. Called customer service, they immediately shipped out another set and didn't make me go through the hassle of returning anything...great customer service. I get the new set and one glass had a small piece of brown debris stuck within the glass and the other glass had three small scratches on it. Now I have 6 glasses half of which are defected. Not happy at all with merchandise quality. World travel while sipping whiskey! I bought these for a friend as she kept admiring mine when I served whiskey in them! They are sturdy glasses and very beautiful to remember past travels and plan future world travel over a whiskey! I love these glasses! This was exactly what I was looking for as a gift for my husband. He enjoys whisky drinks and prefers a solid bottomed glass, that isn't too tall. These glasses were perfect, and the added etched detail made them the perfect gift. We use them all the time. I use it every time I have a glass of scotch and I love it. Quick shipping and perfect gift! I needed this gift within two weeks and I received it four days after ordering! Very pleased with the quick shipping and everything I wanted was in order. I bought this gift for my fiance who enjoys drinking an occasional scotch. I bought four glasses and all of them are great quality with beautiful etching. My fiance was very happy with the gift. I purchased these glasses for my husband's birthday because he has always loved our antique Nescafe world mugs. These glasses are attractive and a great size. One has that wonderful heavy base we like for a whiskey glass. The second one, however, is of significantly lighter weight. For the price I expected uniform quality. Had I taken the time to look at the glasses before giving as a gift, I probably wouldn't have given it. After the recipient opened the package I looked closely at the glasses and both had bubbles in the glass, one on a continent. Also, the etching was only on one side of the glass and not around it, like a globe, which I was expecting. I purchased the glasses and the decanters with the plane and the ship inside as a gift for my whiskey loving husband. Absolutely worth every penny! He loves them! Though I prefer very thin rimmed glasses, these are lovely. These glasses looked perfect online, however they were very disappointing in person. The maps were smudged and scratched and the glasses just looked dingy. I tried washing them but they still look bad. No time to return and replace prior to Christmas, so I will be giving them anyway and feeling bad about giving a poor quality gift. My advice is do not order these. I bought two sets of 2 whiskey glasses and one of the glasses had an air bubble. Called customer service and they immediately mailed out another set without putting me through the hassle of sending anything back...the customer service was great. I get the new set and one glass has a piece of brown debris stuck within the glass and the other has three small scratches on it. I now have 6 glasses half of which are defected. Horrible product quality.